Includes 2 baking trays, 2 nonstick racks, a steam basket, guide, and cookbook.SuperSteam Convection option combines steam and convection heat; reheat and defrost.Measures 20-1/4 by 21-3/4 by 17-1/4 inches; 1-year limited warranty.1.1-cubic-foot capacity; control panel with LCD display; auto cooking categories.Oven for microwave cooking, traditional steaming, or convection cooking. Equipped with state-of-the-art technology, this all-in-one microwave oven allows for making healthier choices when cooking at home. 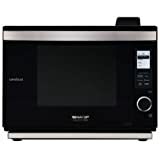 The versatile appliance can be used for microwave cooking, traditional steaming, or as a convection oven with temperatures ranging from 100 to 450 degrees F for baking or roasting. It also provides a SuperSteam Convection option, which combines two types of cooking--superheated steam and convection heat--in order to brown and crisp while retaining moisture and natural flavors. The oven provides a spacious 1.1-cubic-foot interior, which measures 13-3/8 by 14-1/8 by 10-1/8 inches, and its user-friendly control panel with an LCD display ensures simple operation. Choose from a range of automatic cooking categories: in Microwave mode, it offers six Sensor Cook settings, reheat, and popcorn; in Steam mode it offers vegetables, fish/seafood, and poached eggs; and in SuperSteam/Convection mode, choose from balanced meals, poultry, meats, fish, vegetables, pizza, and convenience foods. The unit also provides reheat and defrost options, 11 variable power levels, a 24-hour clock, and sleep mode, as well as a pull-down door, an interior oven light, sound on/off, demonstration mode, a child lock, and a steam-clean cycle. Accessories include two porcelain-enamel baking trays, two nonstick racks (high and low), one steam basket, and a Touch Guide, as well as a SuperSteam Cookbook full of healthy recipes, cooking tips, and nutritional information. Sharp's RK-12S30 Kit (sold separately) allows the appliance to be built into a 30-inch wall oven cabinet, perfect when coordinating with other Sharp Insight and Insight Pro appliances like a lower microwave drawer or warming drawer. If built-in options are not possible, it can also be placed on the countertop or a cart. The UL-listed multi-purpose oven measures 20-1/4 by 21-3/4 by 17-1/4 inches and carries a one-year limited warranty. Sharp's new SuperSteam Oven offers a unique combination of the healthiest ways to cook, all in one versatile appliance: SuperSteam Convection, Steam, Convection and Microwave. SuperSteam Convection is a combination of two types of cooking: superheated steam and convection heat. Sharp uses state-of-the-art technology to superheat steam. Unlike conventional steam, superheated steam helps brown and crisp foods on the outside, while adding moisture to the inside.